The game is played this way: When the president’s budget is released, claim that any difference over 10 years between anticipated Medicare spending (what is known as the “baseline”) and changes in law intended to reduce spending are devastating “cuts” that will harm seniors who rely on the old-age program. But here’s the problem: Most of these anticipated savings are wrung from health providers, not Medicare beneficiaries. Hospitals and doctors may object, sometimes vehemently, but often these are good-government reforms intended to make the program run more efficiently and with lower costs. Let’s check out the Democrats’ Mediscare spin. We will start with the Barack Obama “cuts.” As part of the Affordable Care Act, passed in 2010, Obama included about $500 billion in cost reductions in Medicare over 10 years, mainly from providers but also Medicare Advantage plans (a favorite of Republicans). The savings were used to fund the Affordable Care Act, but they also helped extend the solvency of the Medicare trust fund. By 2012, the 10-year budget window had shifted, and the Congressional Budget Office valued the reductions as totaling $700 billion, giving the campaign of former Massachusetts governor Mitt Romney (R) and his running mate, then-Rep. Paul Ryan (R-Wis.), a major talking point in the 2012 presidential election. One small problem: Ryan had crafted a plan to overhaul Medicare that retained virtually all of the Medicare “cuts” contained in the health-care law but diverted them instead toward helping fund his plan. There’s another reason why Obama’s “cuts” in the end were not so objectionable to Republicans. Marc Goldwein, senior vice president at the Committee for a Responsible Budget (CRFB), has closely studied the details of these proposals. He says many of the Obama efforts to rein in provider spending were actually borrowed from proposals that George W. Bush, a Republican, had made in his final budgets. Now let’s fast-forward to the Trump budget proposal, unveiled Monday. Democrats have claimed he wants to cut $800 billion to $850 billion. Again, that’s a figure based on the difference over 10 years between the baseline estimate for anticipated spending and the Trump budget. To be precise, the difference is $845 billion. But it’s a misleading figure. Trump is proposing to move two parts of Medicare — payments to hospitals that treat many patients without insurance and payments to hospitals that educate medical residents — to another part of the budget. So it looks like a $269 billion “cut” to Medicare. But it reflects spending that would mostly continue, at an inflation-adjusted rate — just not within the Medicare system. The federal government subsidizes most of the funding for postgraduate physician training, and the Congressional Budget Office has noted that federal payments under current law exceed hospitals’ actual teaching costs. Depending on how you do the math, that brings the “cuts” down to $515 billion to $575 billion between 2020 and 2029 — figures that include the proposed reductions in the two programs being reclassified. Those sound like big numbers, but here’s some context. Medicare spending is projected to grow more than $10 trillion over the course of the decade, so it’s essentially a 5 percent reduction in projected spending. Outlays for Medicare are estimated to be 3.5 percent of the gross domestic product in 2029, compared with 2.9 percent in 2018. Moreover, most of these so-called cuts are not coming at the expense of seniors; they are intended to reduce out-of-pocket costs for seniors by making the program more efficient. The administration says the cost reductions would extend the solvency of the Medicare trust fund by eight years. We walked through several pages of Trump’s proposed program changes with Goldwein. Some would save modest amounts of money, others total tens of billions of dollars. Many come straight out of Obama’s playbook, he said. “That’s an expansion of an Obama proposal,” he said, pointing to a $131 billion item to charge the same rate for office visits whether a doctor works at a hospital or elsewhere. “This is an Obama proposal,” he said, pointing to a $38.5 billion reduction in payments for bad debts. All told, the CFRB estimates that 85 percent of the $575 billion in the savings for Medicare in Trump’s budget come from provider reductions, many of which follow a path first charted by Obama. Granted, some might make the case that Obama already grabbed the low-hanging fruit and that this round of provider reductions could lead to fewer doctors being willing to see Medicare patients. That’s speculative at this point, but hospital associations have vehemently protested Trump’s proposals. Hospitals also would be affected by Trump’s plan to dramatically reshape Medicaid, the health program for the poor, from an entitlement program into state block grants or strict per-person limits that are not affected by economic changes. Still, for fans of “Medicare for all” plans — which include many in the Senate Democratic Caucus — it’s important to note that the proposed provider cuts in those plans would be even steeper than what Trump has envisioned. 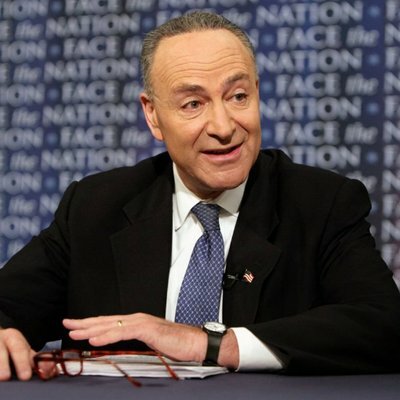 Schumer’s office defended the use of the $845 billion figure, saying it came straight out of Trump’s budget for calculating the impact on the trust fund solvency. His office also said the circumstances are different now, as Trump would not be using savings from providers to expand health care. There are two problems with the Democratic “Mediscare” spin. First, they are using a number that includes “cuts” that are mostly paper shuffling. The $850 billion is too large when talking about the impact on Medicare. Second, there’s the hypocrisy factor. Democrats protested when Obama’s efforts to put pressure on providers was decried as “cuts" to Medicare when it was intended to make the system more financially stable in the long term. Now Trump is extending or following up on Obama’s efforts, and Democrats have decided that what’s good for the goose is good for the gander. But it’s a simplistic way to frame the policy debate, potentially making it more difficult to restrain the growth of entitlement programs as the baby boom generation moves into retirement. 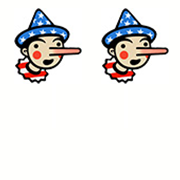 Democrats earn Two Pinocchios, similar to what GOP lawmakers earned when they played this game.